Human beings, by our very nature, don’t like change. That’s problematic when you understand that change is a constant. It happens all the time in our personal and professional lives, and often, there’s not a lot we can do about it. Some of us generally handle change better than others, but depending on the circumstances, every one of us will resist change at some point. Whether it’s in your control or not, how can you learn to manage change better and help your team get through it as efficiently and painlessly as possible? Whether you’re a manager, supervisor, or team member in the trenches, you can adapt more easily to change by understanding how it works. Change is a distraction that reduces productivity, increases absenteeism, and fuels conflict. Supervisors and frontline managers have the toughest jobs because they’re handling all the emotion and distraction when teams are in the thick of a difficult change. Just like the stages of grief, there are stages to change. With small changes, or those we initiated or are in agreement with, we go through the stages more quickly. With larger changes that we don’t agree with, that are externally imposed, or that come as a surprise, we struggle to get through the stages. Sometimes we get stuck in one stage for a long period – or worse, we may even go backwards, creating a seemingly infinite loop where negative patterns are repeated. This is true whether the change is personal or professional. Change is change, and we all have to deal with it whether we like it or not. As described in The Change Cycle™, there are six stages to change – they happen with every change, every time, regardless of how big or small, if the change is personal or professional, self-imposed or externally imposed, welcome or unwelcome. 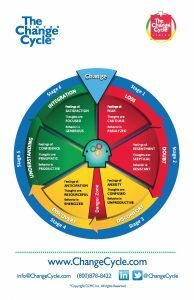 The Change Cycle™ teaches us the brain science behind how humans in all cultures handle change. It’s important to truly understand what’s going on beneath the surface so that you can deal with it effectively. The reality is that you or your team may never like the change that is happening, but you will still go through all six stages of The Change Cycle™. Some stages will be quick, and some may be much slower and more painful than others. While stages of The Change Cycle™ are inevitable, change management can be learned. The ability to manage change comes from understanding that we all go through the six stages in the same order, and there are things we can do to help ourselves through it, even if we get stuck. First, we must learn to manage ourselves within the change, and then (if applicable) we can learn to manage others and support them through the six stages. 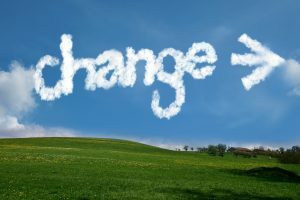 When implementing change, the management team can greatly reduce the backlash by knowing how to introduce it so that it is received in the best possible way. That doesn’t mean everyone will like the change – that’s not the objective. The goal is to simply start off on the right foot. If you and your team could pass through the stages of change more quickly – regardless of how any of you feel about it – wouldn’t that be beneficial to all? Fear, skepticism, anxiety, and confusion are all counterproductive. They can wreak havoc on a team, causing all kinds of internal resistance and conflict, which can drastically reduce productivity and increase sick leave and employee turnover. But, if you know these feelings are coming, and you have tools to address them, you and your team can move more smoothly through the stages with minimal disruption, while maintaining trust and possibly even strengthening relationships. The goal is to get back to being productive, which benefits individual team members, supervisors, managers, and the organization as a whole. Coping strategies are different for each stage, since each represents different feelings and levels of acceptance. To know which strategies to implement, you must first know what stage you and your fellow team members are in. The easiest way to accomplish that is with a tool called The Change Cycle Locator™. Through a series of strategic questions about the change, you can determine which stage you’re in, and identify what you need to do to complete the Cycle. Since human beings don’t process change at the same rate, and everyone will be interpreting the change from their own unique perspective, it’s very unlikely that team members will be in the same stage at the same time. Our ability to adapt to change depends on many factors: how the change was announced; our level of involvement; our opinions and feelings; how long we’ve known about it; our understanding of it; assumptions we’ve made; and so on. Knowing which stage each team member is in can help those implementing the change ask the right questions and take the right approach to help each member move to the next stage. One of the biggest mistakes made when implementing change in teams is the way the change is announced. Often times, a major change announcement is made via a memo or email blast, and everyone is expected to just get on board with it. Management has been planning it for a while, so they’ve had time to go through most of the stages and are feeling great about it. But there’s often a shock when there’s resistance and the staff don’t immediately embrace the change. Management can’t understand why the team doesn’t see how great things will be. This creates an “us vs. them” environment, which is detrimental to all. Learning how to announce the change in the best possible way to reduce resistance and conflict is crucial, as it will ensure you start off in the best possible way. Again, people may still hate the change – but the point is not to make them like it. Instead, we want to help them get through the stages more quickly so that they can be happier, less stressed, and more productive. If your organization is undergoing change, have a look at our options for Change Management courses. These group workshops take place at your location and last anywhere from a half-day to two days, depending on what’s needed. To inquire about The Change Cycle™ training for your group, contact Sophie at 613-234-2020, ext. 21 or sgouedard@pmctraining.com. Sophie can arrange for you to speak with one of our Change Cycle™ Certified Trainers who will help you determine the best approach for your specific situation. Contact PMC today!